Built in 1849. Rebuilt in 1859. William Bonnell was appointed keeper on June 8, 1870 with his wife, Anna serving as Assistant Keeper. When Dennis MacCashin was took over as Keeper, his wife Eliza also served as the Assistant Keeper. When Dennis died in 1903, Eliza took over as Keeper, a post she remained at until the lighthouse was abandoned in 1914. 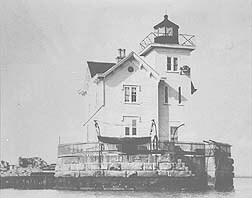 The lighthouse was believed to have been torn down in the 1930's. It stood in Newark Bay at 40° 41' 44" latitude by 74° 07' 40" longitude.